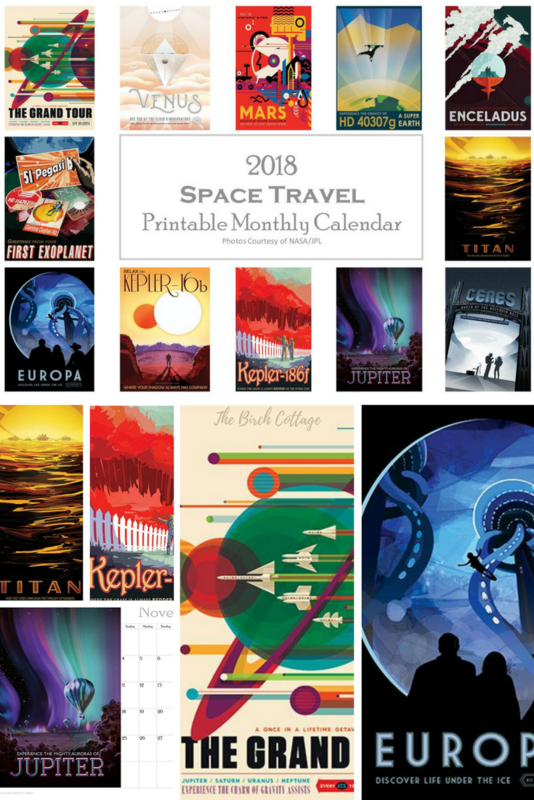 You’ll want to download this 2018 Space Travel Printable Monthly Calendar featuring NASA/JPL Space Tourism Posters! Last month, I shared my 2018 Printable Monthly Calendar on Kenarry: Ideas for the Home. But, today, I have a new calendar for you! It’s not that I couldn’t make up my mind or that I’m forgetful. Remember how I told you I’m going to start being more intentional about the masculine printables I share here on The Birch Cottage blog? Well, that’s exactly what I’m doing! Plus, today is my husband’s birthday. So what better way to celebrate his birthday than by giving you a free printable?! These “Visions of the Future” posters were made available courtesy of NASA/JPL-Caltech. In fact, if you like these posters, they are free for public use. You can visit their site, download the posters of your choosing, have them printed and framed! I decided to incorporate the posters in a calendar. This calendar is available as a free download. Once you download the calendar, you can print it on your home computer. You can also upload the PDF to Staples, have them print and bind the calendar for you for less than $9 (that’s the price in my area). I really just wanted to create a calendar that had more of a masculine vibe than my vibrant and somewhat feminine 2018 printable monthly calendar that features vintage botanical illustrations. You can, of course, visit Kenarry: Ideas for the Home to download that printable calendar as well. 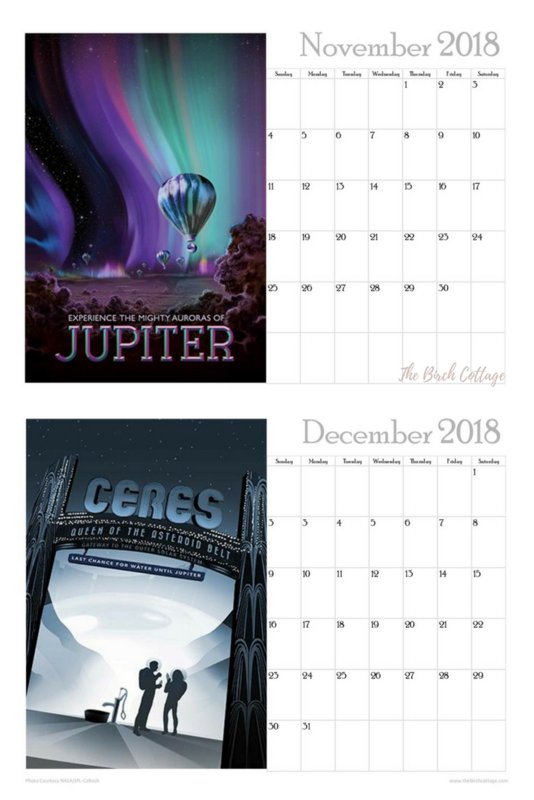 When I first saw these space travel posters, I couldn’t hardly believe that NASA in conjunction with the Jet Propulsion Laboratory at California Institute of Technology released these posters for free public use. 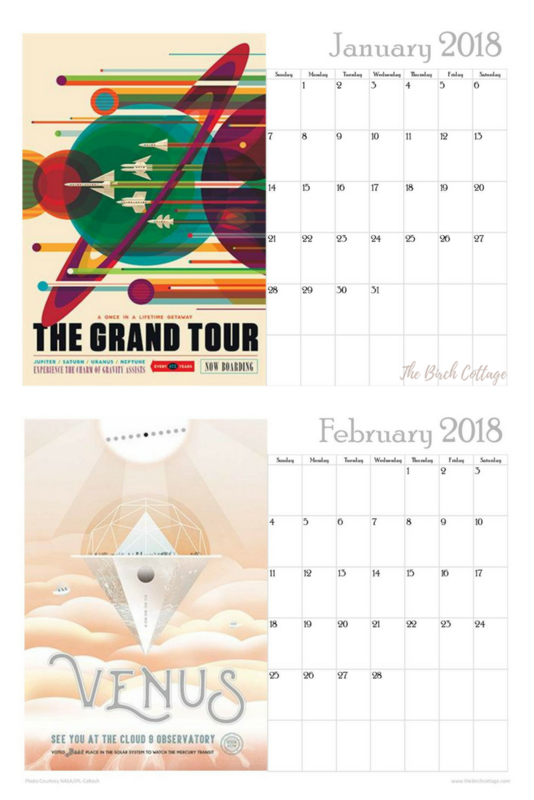 They made me wish our boys were younger (and still living at home) so I could decorate their bedrooms with these amazing space travel posters. Once you subscribe, you’ll receive an email message from me with a link to the Subscribers Resource Library. Actually, you’ll receive this link as a reminder in every email you receive from The Birch Cottage blog. So, just simply follow the link to the Resource Library and download your free printable monthly calendar and so much more! Like I said, I’ve been trying to be more intentional about sharing ideas, recipes and printables that you can share with the men in your lives. 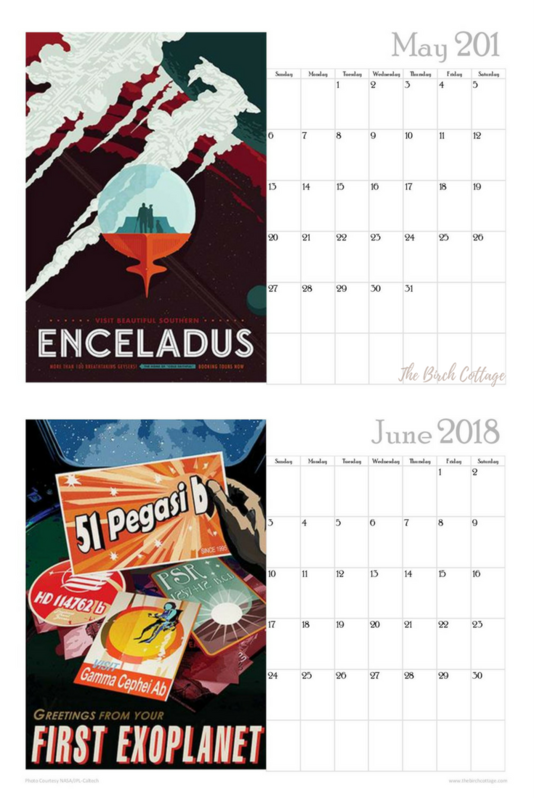 These space travel calendars would make a great gift. (You can even simply upload the PDF to Staples, then have them print and bind the calendar for you.) And if you’re looking for more handmade gift ideas for men, be sure to read the blog post where I shared a fantastic round-up of 25 handmade gift ideas for men! 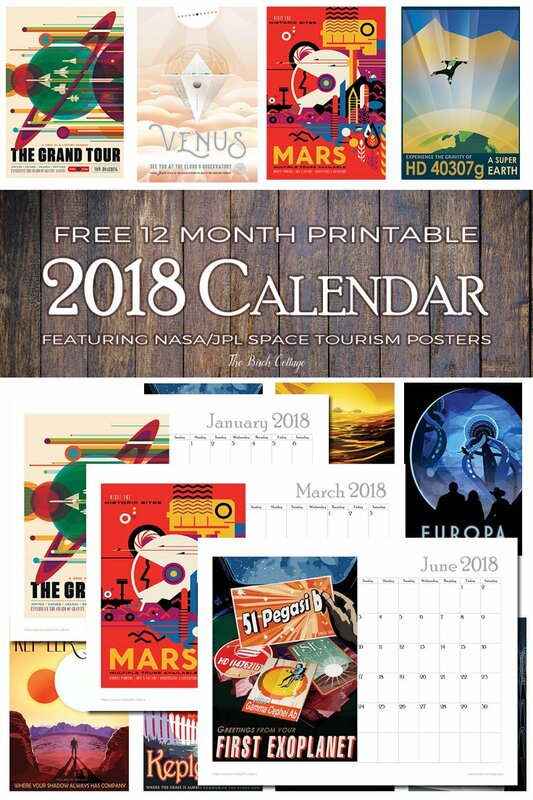 The Space Travel Calendar is saved as a PDF document. Once you download the file, you simply open it using Adobe Reader or your browser and select File > Print. I would definitely recommend using a nice cardstock paper. If you’re feeling creative, you can even purchase a spiral binding machine and spiral bind the calendar yourself! But, they are a little pricy, so unless you’re planning to do a lot of binding, it may not be very cost effective. I love the space travel posters. 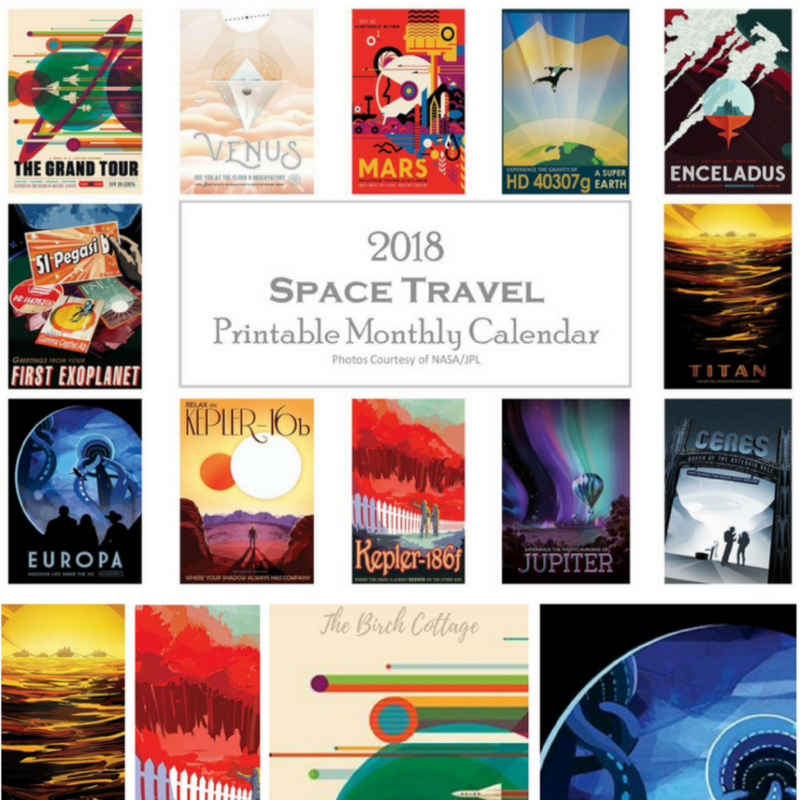 I do hope you’ll find a good home for this 2018 Space Travel Printable Monthly Calendar.